Be the first to share your favorite memory, photo or story of Jeane . This memorial page is dedicated for family, friends and future generations to celebrate the life of their loved one. Jeane Taylor, age 97, former Parsons resident, died at 3:00 A.M., Wednesday, March 20, 2019 at the Cedar Hill Living center in Dallas, TX. She had moved there from Parsons in February of 2019. She was born June 7, 1921, at Galesburg, Kansas to Harlan and Hazel (Wagner) Stringer. Her family moved to Parsons when she was one year old and she attended Parsons schools from Washington Grade School through Parsons Junior College. She had worked for the Hallmark Co. in Parsons and at the Parsons State Hospital. 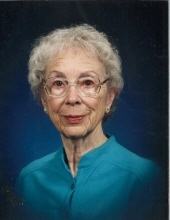 Jeane was an active member of the First Baptist Church and of the Friendship Class. She enjoyed reading, crocheting, cooking, raising flowers and quilting. Surviving are two daughters, Joyce Swann, of DeSoto, TX and Connie Mazza, of LaFollette, TN; 16grandchildren; 18great-grandchildren and a sister, Peggy Cares, of Parsons. She was preceded in death by a son, Gary Degele, two brothers and two sisters. Funeral services will be at 10:00 A.M., Friday, March 29, 2019 the Carson-Wall Funeral Home. The service will conclude at the funeral home and burial will be at Mt. Hope Cemetery in Galesburg. Friends may call at their convenience. Memorials are suggested to the American Cancer Society and may be left at or mailed to the funeral home, P.O. Box 942, Parsons, KS 67357. Online condolences may be left at www.wallfuneralservices.com. To send flowers or a remembrance gift to the family of Jeane Taylor, please visit our Tribute Store. "Email Address" would like to share the life celebration of Jeane Taylor. Click on the "link" to go to share a favorite memory or leave a condolence message for the family.